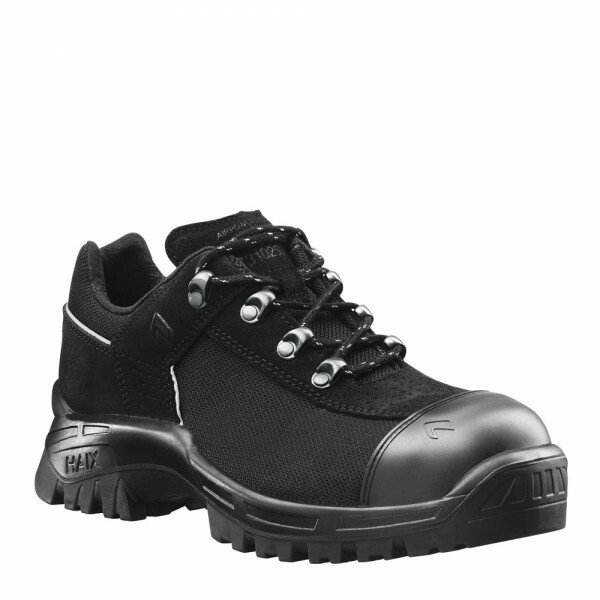 Product information "HAIX Airpower X7 Low"
The Airpower X7 Low by HAIX is a very light waterproof safety shoe which is ideally suited to use by mechanics, carpenters and heating engineers, regardless of whether they are working outside or in a factory. Its breathability and impact absorption properties make it an especially comfortable option which will leave your feet feeling comfortable even after many hours of wear. An padded toe cap makes an important contribution to health and safety at work by helping to prevent injury if heavy options such as tools or construction components should happen to fall on your feet. The sole of the Airpower X7 Low is also resistant against oil and petrol and has an anti-slip treat to ensure a firm foothold on slippery and wet ground. Whilst you are at work, you need to perform to your very best. For this reason, you need a safety shoe which delivers total comfort over a period of many hours, such as the HAIX Airpower X7 Low. A four-ply GORE-TEX® material provides breathability to ensure that your feet will not sweat. At the same time, the shoe is also fully waterproof. Liquids and chemicals such as oil, lubricants, fuels, solvents or mild acids are all unable to penetrate. 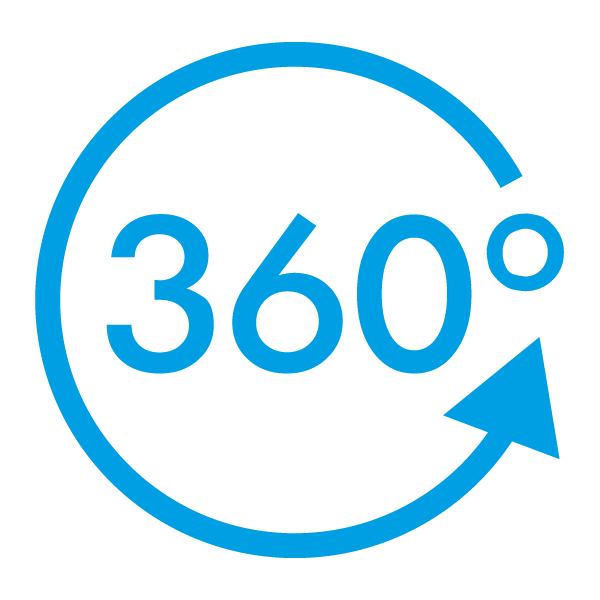 This is a vital aspect of health and safety at work, especially if you are a tradesman or industrial worker who comes into contact with such hazardous materials. The Airpower X7 Low is a weatherproof option which offers outstanding climate comfort all the year round. An anti-slip sole also provides insulation against the cold and ensures that your feet will not freeze whilst you are working outside in winter. A fleece insole also absorbs moisture to prevent your feet from sweating. A special combination of high-quality nubuck leather and polyamide makes the Airpower X7 Low particularly light and comfortable. The latter is highly durable, abrasion resistant and easy to clean. It is also elastic and will follow any movement you make. 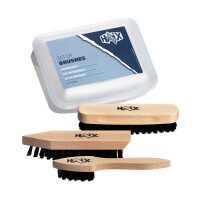 HAIX’s patented Arch Support System delivers outstanding comfort of wear. The heel and ankle areas of the shoe offer a narrower fit and this provide a firm grip. You will also find that the toes and balls of the feet have plenty of room at the front. No pressure points or blisters will occur, even after many hours. The sole of the HAIX Airpower X7 Low contains an impact-absorbing wedge made of PU (polyurethane). This cushions your steps as you go and reduces pressure on the feet and joints, such as when you cross uneven or steep terrain, as well as decreasing the impact on the spine. The upper of the Airpower X7 Low is manufactured in a mix of high quality nubuck leather and textile. An additional rubber cap provides reinforcement at the tip to help prevent wear and tear to the leather. Practical light lacing elements mean that the shoe is easy to fasten. A four-ply GORE-TEX® membrane makes the HAIX Airpower X7 Low both waterproof and breathable. Moisture cannot penetrate. At the same time, dampness is able to evaporate and be expelled. The inner lining is highly abrasion resistant, and the toe cap will prevent any injuries that may potentially be caused by falling objects. The latter is anatomically formed and padded. The narrower heel and ankle area of the shoe offers a secure foothold and supports the feet and joints. The Airpower X7 Low has a robust sole to prevent you from slipping on icy or wet ground. It is manufactured in thermoplastic polyurethane (TPU) and is particularly robust, abrasion resistant and elastic. The sole also provides outstanding insulation against the cold to keep your feet warm in winter as well as being resistant to oil and petrol. An integrated PU impact-absorbing wedge cushions your steps as you go and reduces any strain on the joints. The black sole of the shoe is completely colour fast and will not leave any ugly marks on light-coloured floors, tiles and carpets. The leather and textile mix of the HAIX Airpower X7 Low makes it particularly light and comfortable. 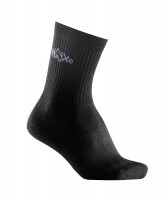 This is a weatherproof option which will protect your feet against the wet and cold. A fleece insole absorbs sweat to keep your feet nice and dry all day long. The toe cap of the shoe makes an important contribution to health and safety at work by preventing injury. Discover the benefits of this perfectly fitting and modern safety shoe for yourself!